La Leyenda has been designed to offer racers and supporters packages that will please a range of tastes and budgets, all of which offer a full, professional level of race service. We offer 2 packages for racers Altiplano and Nevado please read through the information below carefully so you can select the best package for you and your teammate (both racers must have the same package). Please note accommodation, main meals and transport to and from the start finish line are NOT included in the Altiplano package. We have the following upgrades available for the Altiplano Package when you register for those who would like a bit more luxury off the bike. Full mechanical pro service from masquebici and 45 minute massage after every stage. Get both services together for a 15% discount. Any luggage that is not needed during the race (bike boxes, extra suitcases etc) will need to be stored in your hotel and collected at the end of the race, during the race we will transport one bag up to 100L in size, in which you should put all of your necessary clothes for cycling and the evening, medication, electronic devices, free time material etc, this will be your only bag for the 7 days of racing, please note your bag will not be accessible until the end of each stage on transfer days. You will NOT receive the official La Leyenda race bag as part of the Altiplano package so will need to provide your own. If, for whatever reason, you have to leave the race early, it is your responsibility to get to the final destination we will assist you where possible with transport and advice. We're delighted that you've chosen to take part in La Leyenda and you'll be rewarded with some personal Leyenda merchandise to take home with you to show your friends and family. Inside your Leyenda Drawstring Bag you’ll receive an exclusive Leyenda Race Jersey, Bike Number with Timing Chip, Bib Number, Bike Number Stickers, Elevation Profile Stickers, Leyenda Racebook, Sponsors Gifts and personalised Leyenda ID bracelet which must be worn throughout the race. All racers will receive a Kafitt Jersey made from "SUPER LEGGERO" fabric (Polyester 93.6% and 6.4% elastane), designed for competitive cyclists, with an anatomical cut, breathable, light weight fabric (108 g/m2) with partial UPF protection, mesh sides and upper back, flat seam, non-slip elastic strip, 3 back pockets and Italian Azo-Free skin friendly inks. All racers will receive the official Leyenda Racebook with information about the route, towns, Colombia, flora and fauna, sponsors, logistics etc. On transfer days you sign your bag in at the bag lorry and it will be transported to the end of that day's stage, where you will be able to pick it up after leaving your bike for washing and basic maintenance. You must show your Leyenda ID bracelet when signing your bag in and out. GPS data for the route will be made available to all Leyenda racers a couple of days before the race. Each stage will have several aid stations (1 to 3, depending on length, altitude and temperatures) with opportunities to fill up your bottles with water or energy drinks, and also easy to eat, high energy snacks in the form of fruits, cakes, sugary snacks and small boiled potatoes. The aid stations will be shown on the elevation profiles in the Route section of the website and also in the Leyenda Racebook. Upon finishing each stage recovery nutrition and hydration will be available near the finish line. Sponsors Shimano & Specialized will have mechanics available at selected aid stations who will be able to help with quick repairs to your bike, and also have basic parts available for sale, that can be paid for at the end of the stage in the race village. It should be pointed out, however, that you should be able to carry out basic repairs to your bike should problems arise between aid stations or mechanics not being available, such as fixing a puncture, fixing a chain, adjusting brake calipers etc, and not depend on mechanics at aid stations. All bikes will receive a wash at the end of each stage, and also lubrication of chains. Medical support will also be available around the clock during the race and in all the host towns from fully qualified Doctors, Paramedics and Nurses. As well as logistical support for your time on the bike, we'll also be ensuring your safety is our number one priority. There will be motorcycles and 4x4 ambulances placed strategically along the route with fully qualified doctors, paramedics and nurses. Some stages will go above 3,000m for a prolonged period and just above 4,000 m for a short time. We are well aware of the risks this entails and are taking the relevant altitude precautions. Should any problems arise with AMS all staff will be trained in the necessary procedures and we will be assisted by the Defensa Civil (Colombian Mountain Rescue). Oxygen will be available and additional vehicles if you need to be taken to a lower altitude quickly. It should be pointed out that if you are flying from overseas, you will arrive to Manizales at an altitude of about 2,160m it is advisable to arrive a few days before the race to begin the acclimatisation process. We will have the full support of the Colombian Police Force throughout the race with a team of officers specially assigned to the race and also the local police force in each town. Together they will help manage traffic control, route safety and security in host towns. However, we advise you to stick to the right hand side of the road at all times. A few days before the event we will publish a link through which you can register for the above services. In addition to live results Chronotrack will also make available video and photographs of each contestant as they cross the finish line. This can be shared on social media as well. The broom wagon will be for any riders who are unable to carry on due to injury or technical problems, and will run at the back of the route throughout the entirety of that day's racing to the finish. It should be pointed out that if you board the broom wagon you will be classed as DNF (did not finish) for that stage. All bikes will be washed, dried, have their chain lubricated and brakes checked. There will be the opportunity to buy spare parts at the end of stage from Shimano and Specialized, which must be paid for before the start of the final stage (however we also recommend you bring spare parts of your own for a list of recommendations see the What to Pack section). Each finish location will also have a secure bike storage area with Police guards where you will be able to leave your bike. We're well aware that we've put together a mighty challenge in La Leyenda, and so upon finishing the 7 stages, you'll be rewarded with an exclusive finisher's Leyenda T-Shirt, Medal and Espresso Cup, to proudly show off on your return home. To qualify for a finisher's Leyenda T-Shirt, Medal and Espresso Cup you must finish the race in full, without being timed out of a stage. The end of race party will be a celebration of your week's intense racing across Colombia, with food and drinks available to purchase from the fully stocked bar, allowing you to finally sit back, relax and reflect on this momentous achievement with your fellow Racers. Public liability insurance is taken care of thanks to our sponsors WeSura however you will need your own private medical/health insurance for the race. * Manizales will be the start of the second edition of La Leyenda and is located in the department of Caldas, La Nubia is the nearest Airport (MZL) and is a short 20 minute taxi ride to the city centre. Alternatively Pereira located 1 hour to the south of Manizales also has the Matecaña Airport (PEI). ** Please note accommodation is not included before, during or after the race and it is your responsibility to organise accommodation. However, we can recommend the following accommodation which caters for a variety of budgets all of whom can deal with English speaking customers and accept credit card payments or international bank transfers. *** Riders should be able and prepared to perform regular maintenance on their bicycles during the race (fixing punctures, replacing brake pads, fixing broken chains etc). We strongly recommend getting your bike comprehensively serviced prior to the race. Technical support will available only at selected Aid Stations during the stages. There will be technical support available with spare parts for purchase (subject to availability) at the end of each stage. Any spare parts will be at an additional cost to the rider and must be paid for before the final stage. Failure to pay for any parts or service will result in you not being able to start the final stage. The Organisers take no responsibility for any additional parts purchased or services carried out on bicycles. **** To help you relax and rest your muscles after a day's cycling, there will be masseuses on hand to provide massages at an additional cost that can be booked in advance. The Nevado Package includes 6 nights of race accommodation in the 3 host locations during the race include a tropical holiday resort with swimming pools (La Rochela), an historic colonial town (Salamina) and a mountain hotel with thermal baths (Termales del Otoño). La Rochela: You will be in twin rooms with your teammate in clean and comfortable cabañas, bathrooms will be shared with 1 or 2 other teams. Salamina: If you register early you will be in twin rooms with your teammate, those who register later will be in rooms of 4 beds with another team. The majority of rooms have private bathrooms. Termales del Otoño: Again those registering early will be in twin rooms or cabañas and those registering later will share rooms of 3 or 4 beds. All rooms have private bathrooms. Please note accommodation is not included in Manizales the night before the Prologue, or at the end of the race after stage 6. However, we can recommend the following accommodation which caters for a variety of budgets all of whom can deal with English speaking customers and accept credit card payments or international bank transfers. Breakfast, Lunch and Dinner will be served in the form of a buffet, either in the hotel where all racers are staying or a central location in the town when racers are staying in various hotels. Food will be prepared by specialist chefs with as many locally sourced ingredients as possible, and be rich in carbohydrates, protein and vitamins. Of course we know you might want to relax in the evenings, so alcoholic beverages will be available to purchase too. We have the following upgrades available for the Nevado Package when you register for those who would like a bit more luxury off the bike. Upgrade to have your own room in the best available accommodation in each race location and room to room luggage transfer. If you would like us organise your pre/race accommodation and airport tansfers please contact us at register@la-leyenda.com for additional information and prices. * Please note prices vary depending on type or room required, number of nights required and which airport you are arriving to (Manizales or Pereira). Any luggage that is not needed during the race (bike boxes, extra suitcases etc) will either need to be stored in your hotel or checked in at registration and collected at the end of the race, during the race we cannot transport any luggage apart from your official Leyenda Race Bag. At registration you will be given a 100L (approximately) duffle bag, in which you should put all of your necessary clothes for cycling and the evening, medication, electronic devices, free time material etc, this will be your only bag for the 7 days of racing, please note your bag will not be accessible until the end of each stage on transfer days. We're delighted that you've chosen to take part in La Leyenda and you'll be rewarded with some personal Leyenda merchandise to take home with you to show your friends and family. Inside your Leyenda Race Bag you’ll receive an exclusive Leyenda Race Jersey, Bike Number with Timing Chip, Bib Number, Bike Number Stickers, Elevation Profile Stickers, Leyenda Racebook, Sponsors Gifts and personalised Leyenda ID bracelet which must be worn throughout the race. Sponsors Shimano and Specialized will have mechanics available at selected aid stations who will be able to help with quick repairs to your bike, and also have basic parts available for sale, that can be paid for at the end of the stage in the rave village. It should be pointed out, however, that you should be able to carry out basic repairs to your bike should problems arise between aid stations or mechanics not being available, such as fixing a puncture, fixing a chain, adjusting brake calipers etc, and not depend on mechanics at aid stations. All bikes will receive a wash at the end of each stage, and also lubrication of chains. ** Please note accommodation is not included in Manizales the night before the Prologue, or at the end of the race after stage 6. However, we can recommend the following accommodation which caters for a variety of budgets all of whom can deal with English speaking customers and accept credit card payments or international bank transfers. For those opting for the Supporters package you will be able to follow the entire race with exclusive access to the whole route or if you prefer to you can dip in and out of the race and see some of the other amazing things Colombia has to offer by taking advantage of the optional activities listed below. The package purchased by the racer you are accompanying (Standard Nevado Package or Hotel Upgrade). For the Nevado Package (standard) your accommodation will be assigned as follows, subject to availability: a) in a room sharing with the team, b) in adjoining rooms for the racer and his supporter and the other member of the team or c) a room for the racer and his supporter totally independent of the other member of the team. For the Nevado Package with Hotel Upgrade a private room is assigned for the racer and his supporter, in the best accommodation available in each location and also includes all the other benefits of this upgrade. What does the Supporters package include? Once you have purchased the Supporters package, please follow the instructions in the confirmation email so we can organize the most appropriate accommodation according to your needs. Today you'll be transferred to one of the Colombian Coffee Region's most beautiful and famous coffee haciendas. Hacienda Venecia is over 100 years old, and its beautifully restored main farmhouse is the epicentre of one of the largest coffee growing haciendas in the region. Here you'll be taken through the coffee cultivation process, right from nursery stage through to tasting. After lunch and some time to enjoy the surroundings, we'll head off for a drive through to Chinchina, where we can observe the stunning countryside which has placed Chinchina as the unofficial centre of Colombia coffee growing. This morning we'll head out early to ascend 2,000 meters to the entrance point of PNN los Nevados, one of Colombia's most famous and naturally stunning national parks. Home to 8 volcanic structures and volcanoes, 3 of which are glacier capped, Los Nevados will give us the opportunity to see one of the most unique ecosystems in the world - the Paramo a landscape of mist, water and flora that seems otherworldly. During our visit we'll be looking out for various species of endemic birds and wildlife that has specifically adapted to the harsh conditions. Don't forget those binoculars as we head off to hotel Termales El Ruiz Colombia's highest hotel at 3500m to continue our search for various specie of hummingbird, here in the Central Andes. 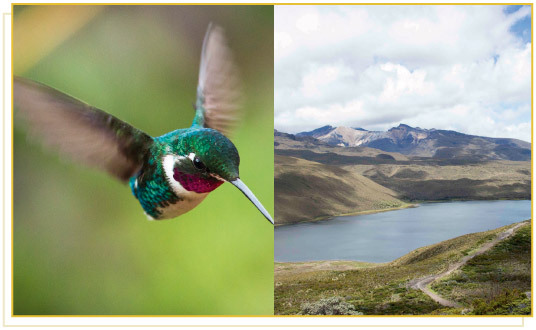 We'll explore forest trails and relax by streams and waterfalls surrounded by hummingbirds, and then have a dip in the hotels hot springs, heated from below by the nearby glacier capped Nevado del Ruiz Volcano.